The official release of Firefox 3.5 is almost here. At Mozilla Japan, we have been planning a project to promote the new version of Firefox. Today we have started the Discover Shiretoko campaign along with the non-profit Shiretoko Nature Foundation of Hokkaido, Japan. As some of you may know, each version of Firefox has a code-name that is the name of a national park. The code name for Firefox 3.5 is "Shiretoko" which is taken from the name of the Shiretoko National Park in Northern Japan. In addition to promoting this new version of Firefox, we wanted to also take this opportunity to co-promote the beautiful natural forests of Shiretoko, Hokkaido which were given UNESCO World Heritage status in 2005. Why is Mozilla collaborating with a non-profit nature conservancy organization? In fact Mozilla and this organization have a number of common goals and you can read 4 stores about Firefox and Shiretoko at the Discover Shiretoko site. In addition, in order to get more people to know about both the Shiretoko national park as well as the new version of Firefox, we've started a web banner campaign called "tree banner." This banner uses the Canvas element to grow a "virtual tree" on your site. In addition you can see all of the other people who have registered at Discover Shiretoko to grow a virtual tree on their own site at the interFORest site which shows all of the virtual trees growing on a virtual map of the Shiretoko peninsula. For more details on the banner campaign, please go to the Banner Campaign site at Discover Shiretoko. 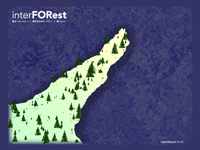 To see a map of all the participating websites, please go to the interFORest site. We hope you will support both Firefox 3.5 and Shiretoko with these banners on your website or blog. I would like if you could update Foxkeh theme. I really like it but when I updated to 3.5 it doesn't work any more. Please if you could make foxkeh theme compatiable with 3.5. I really liked it but when I updated to 3.5 it wouldn't work any more. So the Mozilla Japan crew is busy with something to promote Firefox 3.5 release. Any ideas as to when FoxKeh will be out for FF3.5?? Until then, I'm reverting back! Rotfl! I downloaded Mozilla Firefox 3.5, so I can't put the add-on theme of the fox you did for the version 3.0.0 of firefox. Do you make the same for the version 3.5 or not? I loved this theme and I want to keep it. However it's impossible for the moment. I love the Foxkeh theme for firefox. I would love to see it for the 3.5 version as soos as possible. I want Foxkeh for 3.5 too! I updated at work and when I realized he won't work I refuse to update at home until I can have Foxkeh back. please update foxkeh theme to 3.5!!! I want the Foxkeh theme for Firefox 3.5 too :( please update it soon, && possibly have it compatible for Linux systems too? It's so cute everyone should be able to have it c: ! Please can you update the FOXKEH THEME for firefox 3.5 ? Somebody dropped the ball on this one. I was very disappointed to find that FF 3.5 killed my very very pleasing visual view of FireFox. It is now so nauseatingly gray and bland that I'm almost ready to go back to IE. There's no difference in the view now, so what's the point? Please fix this as soon as you are able. I was angry at the unexpected change and was unfair and ignorant in my response above. I apologize for my childish and disrespectful attitude. I know that you will come out with a suitable upgrade, and I should not have taken it out on you folk. Thank you for the excellent theme in FF 3.1. I am looking forward to the new one. The "AnyColor" add-on helps a bit. It has a Foxkeh theme choice, though not as nice as the actual Foxkeh, it did give back a semblance of it. Much more pleasant to look at now. What everyone else said. Please upgrade Foxkeh theme. It has been months now since Foxkeh has run in my browser. Do we have to wait for his 3.5th birthday? The Foxkeh personas are great!